With Valentine’s just around the corner, we often turn our attention to “that someone special” or romantic love. Intimacy and connection with others is important to us, but how much do you love or even like yourself? After 7 years of providing deep emotional support and healing after being trained in “Emotional Clearing”, a form of interactive guided mindfulness meditation, similar to Vipassana, a Buddhist meditation which means “clear-seeing”, and what Mindfulness Based Stress Reduction is based on, and providing Emotional Freedom Technique (EFT), I have witnessed how all types of emotional, psychological, spiritual, and often, physical pain go back to how much a person loves and accepts or rejects themselves. 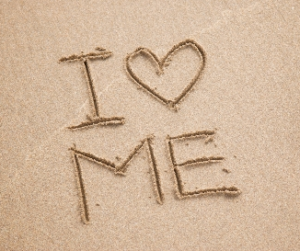 In fact, the core statement that Gary Craig developed in EFT has it in it, “Even though I (insert challenge), I deeply and completely love and accept myself.” He is a wise person, indeed. Maybe try that now. Think of something that is challenging for you or you don’t like about yourself. Insert it into the statement above. Notice how you feel saying the full statement. Notice what emotions arise or body sensations you experience. Notice how you may be judging vs. accepting yourself and the way you feel. This chasm is where heart-ache, dis-ease, and illness can begin. This is where the tension may lie within you that creates disharmony within yourself and the very relationships with others you seek to achieve. Seeking to find the source of this unwanted stress and disharmony can bring a deeper awareness into the areas within you that do want more love and acceptance, and it can assist with prevention of illness or dis-ease, and even help heal it. Hint: We tend to avoid, reject, repress, blame, project onto others, and deny the areas within that we don’t like within ourselves. Things like fear, anger, sadness, loneliness, and jealousy. These are the very areas that feel separate from ourselves, that feel separate from love. It is easy to accept the parts of ourselves we deem good and acceptable. The parts of us that need the love, acceptance, and healing even more are the hurt parts, the parts we judge, the parts we deem inadequate, and unworthy of love. As you allow yourself to bring your attention to these parts of you, to bring them the attention they deserve and need, to love them, accept them, and bring them to the light, you will find you like, and even… love yourself more. Your relationships with yourself and others will be more fulfilling. You will be more forgiving of yourself and others. You will be more compassionate with yourself and others, and be a whole lot more joyful and peaceful. Emmy Vadnais, OTR/L is a Holistic Occupational Therapist who provides Mind, Body, Spirit Healing, Prevention and Wellness services and education. She can be contacted at emmy@emmyvadnais.com or www.emmyvadnais.com. « Holistic Health Consulting for You!